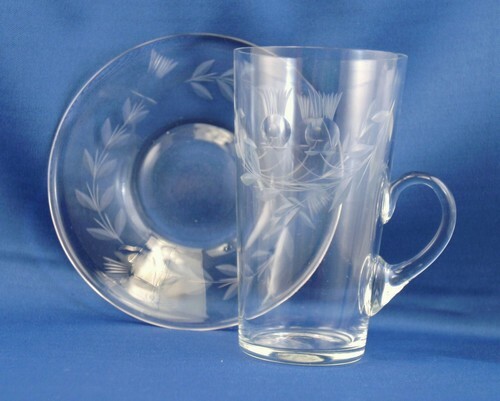 Set of hand-blown molded glass mug and plate with wheel-cut thistle design. The mug tapers from a delicate lip to a substantial base and has an applied handle. The plate is slightly raised in the center and would serve tea cakes or sandwiches. The mug measures about 2 3/4 inches across the mouth and 3 1/2 inches across including the handle. It is 4 7/8 inches high. The plate is about 5 1/8 inches across by 5/8 inch high. Condition is excellent. No chips or dings. Since these are hand-blown, there are some bubble inclusions from the manufacture. We have three sets of these and an extra plate. The extra plate will be included if you buy all 3!